It's been a while since I've posted anything about the poor honey bees. But I've just created a new petition targeting Bayer Crop Science, one of the key corporations responsible for the chemicals contributing to colony collapse disorder. Can you please sign today and then share the petition to help reach 10,000 signatures by the end of this week? That ought to make Bayer sit up and take notice! In an effort to protect its own dwindling honey bee populations, Europe has slapped a two-year ban on neonicotinoids, the class of pesticides that appears to be at fault for much of the bee deaths. In addition to asking the EPA and the FDA to step up (please add your name if you haven't signed yet), I'd like to approach the problem from another angle -- targeting the source of the pesticides killing our bees. Headquartered in Germany (where neonicotinoids are now banned...), Bayer Crop Science is responsible for two of the three pesticides (clothianidin and imidacloprid) known to contribute to colony collapse disorder. 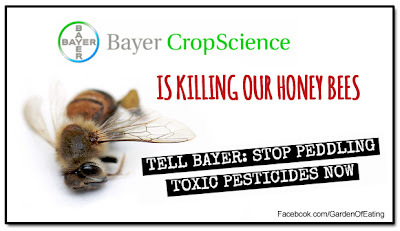 It's bad enough that Bayer's products hurt our honey bees and contaminate our soil. But their surface attempts to make it look like they care about the environment are both futile and offensive. For example, Bayer Crop Science proclaims itself the "Protector of Crops" and likes to tout its commitment to sustainability (see the screenshot from their site below) and to the health of bees. Please sign the petition and then share to build the buzz for honey bees. All PPl. need to understand this..